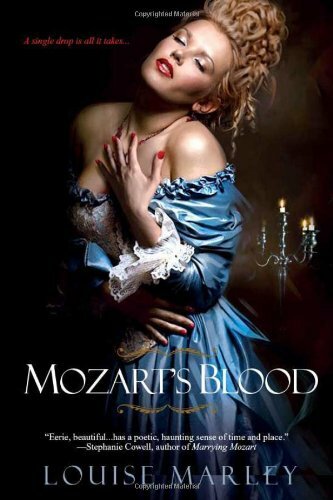 Mozart’s Blood is historical fiction based on a real-life character, the opera singer Teresa Saporiti, who created the role of Donna Anna in Mozart’s opera Don Giovanni. The story spans four centuries and takes place in half a dozen great opera houses. It’s all about an abiding passion for music which even time and death cannot extinguish. The cover art is by Jon Paul, and the jacket design is by Kristine Mills-Noble. "Marley, a musician and writer, has produced a stunning drama inspired by the life of Teresa Saporiti, the first Donna Anna. Teresa, an aspiring singer, was turned into a vampire by a Czech aristocrat. As bad as the need for blood are the memories of the victims, which remain with the taker. Teresa has learned to deal with them, but Mozart, whom the baroness bit at the same time, never did and died painfully because he could not bring himself to satisfy the unnatural thirst. In San Francisco in 1906, Teresa meets Ugo, a Silician werewolf with a very curious past of his own. They become partners, guarding each other’s backs. In twenty-first-century Milan, an egoistic baritone thinks he has figured out Teresa’s secret and abducts Ugo to obtain the blood that holds Mozart’s memories. The story covers four centuries, but the shifts between the past and the present are seamlessly handled, and the development of Teresa and Ugo over those centuries is impressive. An engrossing piece, from overture to final chord." "Just when you think you’ve read everyone in horror who matters, along comes Louise Marley with her amazing and lyrical vampire tale, Mozart’s Blood. Gripping, artful, tellingly detailed, and impossible to put down, Mozart’s Blood is that rare kind of horror novel that works on more than one level. It’s visceral. It’s evocative. It’s scary. It envelops you in atmosphere and delivers on its promise to tell a compelling story." "This novel is no chic-lit paranormal romance. This is serious vampire literature and one of the best I've come across in years. Marley's writing is outstanding and very polished. The story bursts with breathtaking passionate scenes of emotional torment, the operatic voices vibrate off the page, her characters are crafted with depth and humanity, and the plot is very inventive. This is a story with soul, one that is a cut above all the rest of the vampire fiction out there now that is being mass produced like paper dolls. Dripping with 18th century history, Mozart's Blood is a sensational read not to be missed for any fans of vampire novels and I personally am hoping for a sequel. Bravo! I stand up and applaud!!!!" From A.M. Dellamonica: "To be an up and coming soprano with a contract to sing Donna Anna–in Milan, at La Scala, no less!–is already to be extraordinary. Octavia Voss is even more singular than that. Born in Italy centuries before the present day, she left home as a teen to pursue the dream of becoming a singer. Talent and determination get her into an opera company, but there she learns that her voice is perhaps less special than she imagined; her career prospects may be limited. "Then a depraved-seeming Countess lures Octavia and the company’s composer into a tryst. After the encounter, Octavia has been utterly transformed. She craves blood, for one thing. For another, she, the Countess and the composer all share each others’ memories… a powerful thing, considering that the composer is Wolfgang Amadeus Mozart! "A cold-blooded creature she may be, but Olivia is a fundamentally caring woman, and it is this quality of hers that gives the book its warmth: her affection for Ugo, her sexual interest in one of the other singers, and above all her passion for opera offset the cruel realities of her condition. Mozart’s Blood tells us her life’s story, and Ugo’s (which is every bit as intriguing) in flashback, and both histories are impeccably researched. 4 Stars This well-written, intelligent approach to the paranormal features an opera-singing vampire and her werewolf assistant. Rich in operatic detail, the tale alternates between the present and various time periods throughout the past several centuries. In an interesting twist to the conventional creation-of-vampires story, memories of those bitten live on through the shared blood. Ms. Marley's vampires are not the vicious monsters of the Nosferatu mythos. Nor are they saccharine, misunderstood sweeties of Twilight. They are-strange as it may sound in this context-ordinary people. They don't sleep days. They don't twinkle. They lead normal lives, at least, normal as it is construed in the world of opera. These people want things and, to get what they want, they do things, things that don't always work out. Like humans they suffer the ravages of time and loss, albeit on a different scale than most of us. First and foremost, our heroine wants to sing, needs to sing, with a need that overshadows her need for blood, and Ms. Marley deftly plays these competing drives against each other. Her picture of backstage life at a Don Giovanni production rings true. Her characters, be they prima donnas or supporting artists, offer a fascinating counterpoint between the singers and the roles they undertake. There are theatrical disasters, which seem trivial to outsiders, and raptures incomprehensible to the uninitiated. In short, Mozart's Blood really is about opera. And yet, you don't need to know a thing about opera to enjoy the book, because it's all wrapped up in an exciting story. Lastly, Mozart's Blood is something I never expected to see: a fresh and unexpected take on vampires. Go read it!